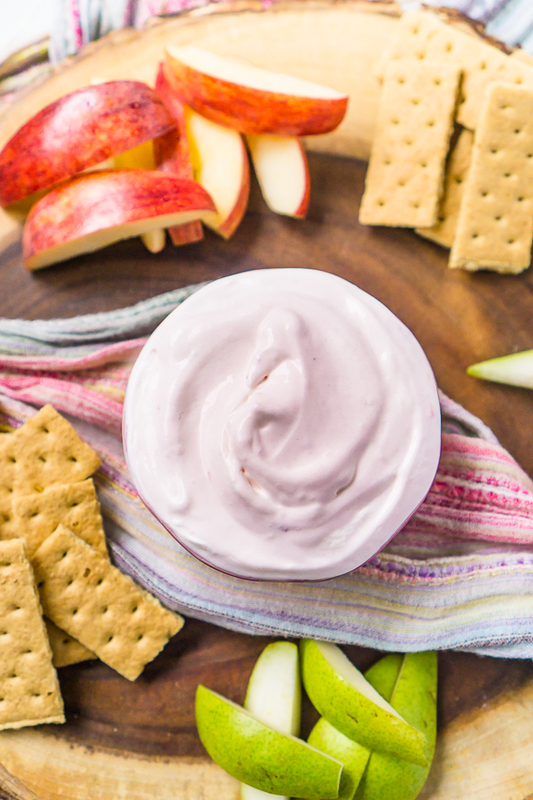 This light, sweet Strawberry Cool Whip Fruit Dip was one of my favorite kid recipes growing up that my mom would make, and I still love it as a mom myself now, too! Easy to make and a delicious pairing with Strawberries, grapes, apples, graham crackers and more! 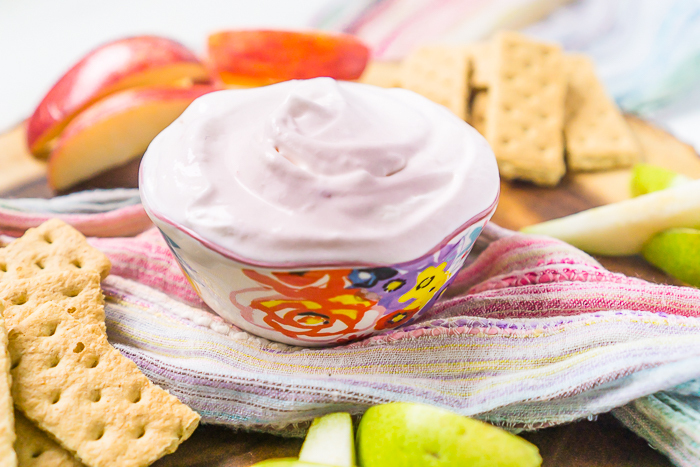 A Kid Friendly Cool Whip Fruit Dip with Strawberry Yogurt that the Whole Family will Love! This Strawberry Fruit Dip is one of those recipes from childhood that stand out clearly to me even now. My mom would whip up a Frozen Strawberry Yogurt Pie and make extra filling for us to have with fruit and graham crackers. It is light, fluffy, sweet and addicting! As a kid, I would scoop up big amounts on my crackers or strawberry, devouring the treat as quickly as mom would allow me. Even now, I still find it addicting, and Liam immediately became a fan as well. While I make this all year long, I think it’s perfect for Valentine’s Day! It’s pink color makes it feel festive without being as heavy as the traditional chocolate or cupcake treats. I would rather have this Cool Whip Fruit Dip over a Valentine’s Day Cupcake any day. Honestly. Most people obsess about chocolates, candy hearts, and cupcakes for Valentine’s Day, but that just isn’t my style. Probably because I’m a pretty picky sweets eater: I prefer dark chocolate over milk chocolate, I don’t eat unmarked candies from a box because most fillings are sort of gross to me, I hate cake, and I’m not a fan of candy hearts. But give me Strawberry Fruit Dip recipe with fruit platter at Valentine’s Day party and I’m happy! Plus, it’s a 2 Ingredients Fruit Dip and only requires you to mix the two ingredients together, which makes it one of the easiest Valentine’s Day recipes you would probably be making. I do love easy recipes! 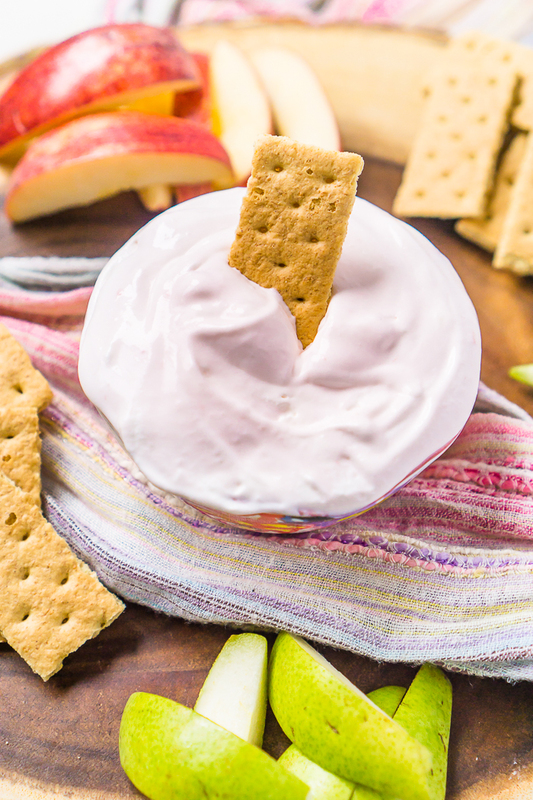 Light and Easy Strawberry Fruit Dip with Cool Whip! Easy Two Ingredient Strawberry Fruit Dip is loved by both kids and parents! With it’s light pink color, it makes the perfect Valentine’s Day recipe! In a bowl, mix together the Cool Whip and the yogurt until combined. You do not want to over stir. Store in the fridge until you are ready to serve! Enjoy! This is so perfect for summer entertaining! My family loves snacking on this, and so do I! Yummy! I have a similar recipe on my blog. But I’m sure yours is healthier. :).